A Visi innovation in using stored fat as a fuel source. New Science Based Drink "Signals the Body to Burn FAT!" is a clinically proven, patent pending formula which includes a new ketogenic technology to help you reduce your appetite and convert stored body fat into energy. Its method of energy use is one of the most efficient and effective ways to reduce body weight and preserve lean muscle mass! TruKeto is a powder, conveniently packaged into single-serve stick packs for on- the-go use, that targets and burns body fat with every serving! Activated Ketones - Helps your sugar-burning body morph into a fat-burning machine. Ketogenic Diet Support - Helps achieve ketogeneric diet benefits without strictly following ketogenic eating guidelines. Mental Clarity & Improved Focus - Neurons are 38% more efficient using fat for fuel vs sugar. Active Lifestyle & Athletic Performance - Non-stimulant energy and endurance, no lactic acid build-up, fast recovery. 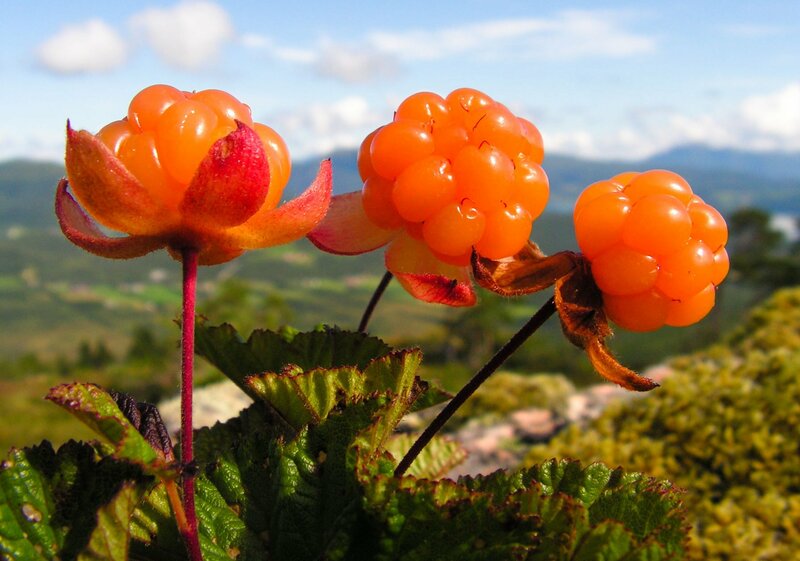 Arctic Cloudberry & Lingonberry - Vital phytonutrients that are a great source of fiber, essential minerals and vitamins. TruKeto is a break-through fat burning formulation. compared to other ketone products. Active lifestyle/athletic performance - non-stimulant energy and endurance, no lactic acid build-up, fast recovery. Ketogenic Diet Support - ketogenic diet benefits without strictly following ketogenic eating guidelines. Nootropic - ketones promote mental clarity and focus. Diabetic support - lowers blood sugar without becoming hypoglycemic. Activated Ketones - other formulas are made up of only BHB (Beta Hydroxybutyrate) salts and work passively. TruKeto's patent pending blend of a small amount of BHB coupled with BA (butryrate) - the BA actively signals the liver to begin ketogenesis - oxidize/release fat cells as fuel (FAT BURNING). This technology literally gives your body the power to use its own stored fat for fuel! MCT Oil Free - BHB only formulas actually prevent the body from utilizing its own fat stores to produce ketones. Immediate Absorption - TruKeto - being an active component does not require salt and is immediately absorbed. BHB only formulas require a large amount of salt and are required to be broken down and burned off as sugar which slows ketogenesis. Comfortable Ketones - other keto formulas are made up of only BHB salts and need to be broken down in the gastrointestinal tract for an extended amount of time resulting in bloating, gas, diarrhea and other discomforts. TruKeto does NOT cause and gastrointestinal discomfort. Mix 1 packet with 8-16oz of water. Shake well and enjoy! For optimal absorption take on an empty stomach 30 minutes before food. FIRST take your first TruKETO serving between 6:00-9:00AM on an empty stomach. DRINK WATER drink 1/2 your body weight in ounces. REDUCE PROCESSED FOODS reduce your daily intake of processed foods and refined sugars. REDUCE CARBS reduce your daily intake of flour, wheat, and grains as much as possible and replace with leafy greens as your cash source. INCREASE HEALTHY FOODS especially healthy fats such as avacoda, almonds, etc. ADD HEALTHY SNACKS enjoy 1-2 Probita chews in between meals. DOUBLE UP add a second serving of TruKETO between 2:00-4:00PM on an empty stomach or 30 minutes prior to athletic training to help stay in hyper-ketosis and optimize fuel source to muscles. TruKeto actually targets and burns body fat with every serving! So experience this new kind of fat burning energy as you transform yourself into a leaner, stronger, more vibrant you! 1. 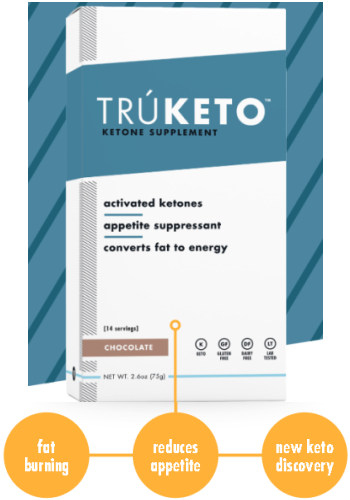 TruKeto provides activated ketones. 2. TruKeto signals fat cells to release fat for use as energy. 3. TruKeto signals the liver to oxidize (burn fat). TruKeto is a great pre-workout booster. Due to the quick onset of ketone activity (15-20 minutes), TruKeto serves as a great workout strategy for improved workout mood, energy and stamina. 1. TruKeto is easily absorbed and fat provides 9 calories per gram of fuel. 2. TruKeto reduces lactic acid build up in muscle. 3. TruKeto provides fat to fuel neurons for greater focus and clarity. 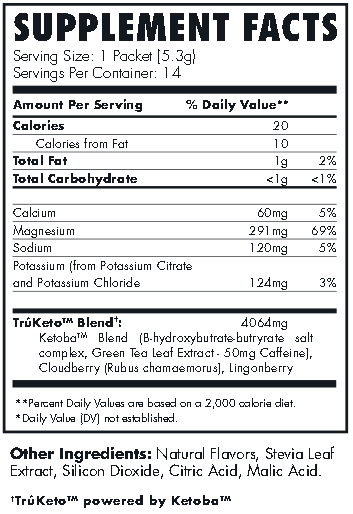 TruKeto is unlike other exogenous ketones. 1. Patent pending blend of activated ketones for immediate absorption. 2. Low sodium and low dose required to signal fat burn. 3. Helps regulate blood sugar so body can stay in fat burning mode.